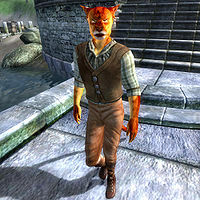 S'rathad is a Khajiit commoner who lives in the Imperial City's Talos Plaza District but also spends time in Skingrad. At midnight on the 26th of each month, he will leave the Imperial City and head to the Two Sisters Lodge in the southern part of Skingrad. Once he arrives, he will stand in the bar area before heading home no earlier than midnight on the 28th. When not on this trip, S'rathad sleeps in his house from 10pm until 6am and then eats breakfast there for two hours. After that he heads off to the Waterfront District and will wander around the area until 8pm when he heads for The Bloated Float Inn and spends two hours there before heading home once more. On Loredas, he eats breakfast as usual, then wanders around his house until 2pm when he makes a trip to the Temple of the One, where he prays for four hours. At 6pm he heads to the Elven Gardens District to eat dinner at The King and Queen Tavern before going home at 8pm. Sundas is his rest day, and he will remain in his house all day, sleeping and eating at the usual times. The exception to this schedule is during the Light the Dragonfires quest, when all residents of the Imperial City are under martial law and confined to their houses. A Khajiit of few words, S'rathad will only say, "S'rathad greets you." when met for the first time, and "S'rathad learns the city by walking, talking, seeing it all. S'rathad thinks this is the best way for you, too." when asked about the Imperial City. S'rathad wears a middle-class outfit of tan linens, a plaid shirt, and quilted shoes. He also carries a few gold coins and his house key. This page was last modified on 31 January 2018, at 23:23.